Tactics are a crucial part of any war and can sometimes mean the difference between life and death on the battlefield. Tank warfare is no different and players should consider investing in tactics available for World of Tanks to improve their chances of survival and success. A number of core tactics and recommendations are available below. When the player angles their tank the armor's ability to deflect or ricochet an enemy round improves with each degree the armor is angled. This is known as the Effective Armor Angle value, meaning the armor's thickness improves mathematically allowing it to be stronger and more effective without actually physically changing the armor tickness. Combined with the above factors a player can reduce, sometimes significantly, the chance of an enemy round penetrating their tank and causing damage. 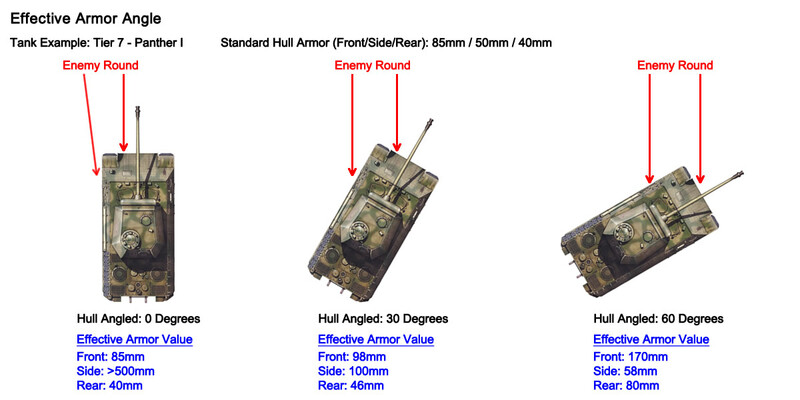 Note that angles greater than or equal to 70 degrees will bounce / ricochet any AP or APCR enemy rounds irrespective of armor thickness and armor angle. Angles greater than or equal to 85 degrees will bounce / ricochet HE and HEAT enemy rounds irrespective of armor thickness and armor angle. It is very important to note that a player can only maximise their armor effectiveness against a single direction of enemy attack i.e. front or side, but not both. Sidescraping is an armor angling technique whereby the side of the tank is angled sharply towards the enemy at an angle greater than 60 degrees whereby most enemy shots bounce. Angles greater than 70 degrees will almost definitely bounce if an enemy round was to hit the side hull. However angling the hull is not effective unless the rest of the tank is also protected in particular the front hull of the tank. Players should consider using Cover and only expose part of the turret and the side of the hull. The front track will be exposed so expect to be tracked however being tracked generally wont reduce the tank's hit points. Effective Attacking with large obstacles involves using your environment to your advantage to mount a more effective attack on enemy tanks while in turn protecting and minimising damage to the player's own tank. The techniques below present a sequence of "Attack - Use Cover and Reload - Attack" moving the tank to and from cover and repeating the sequence. It uses a combination of Armor Angling, Sidescraping, and Cover. Position the tank behind a solid object e.g. building or large rock to provide protection from artillery. Ensure armor is angled. Once the enemy exposes the hull FIRE! Move back into attack position ensuring tank armor is angled and FIRE! Flanking in military terms is attacking the enemy at the left or right sides that forces them into a two front battle, and has been around in warfare for generations. Armored warfare is no different. In fact executing a flanking move in World of Tanks is not very difficult however its important to note that while any tank can flank an enemy tank it is best put to use by Assault Support and Assault tanks who can get into firing position relatively quickly. The two examples below illustrate flanking attacks.